E-Z Out Skeleton - Fine Edge. 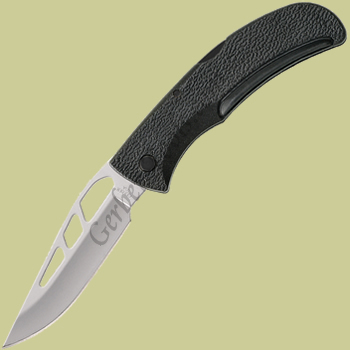 The Gerber E-Z Out Skeleton knfe model 06701 46701 has holes cut in the blade to lighten it. This traditional lockback knife has a razor sharp high carbon stainless steel blade, and a glass filled nylon handle. The handle has softgrip inserts to make it more comfortable. The holes in the blade make it easy to open the E-Z Out Skeleton with one hand.